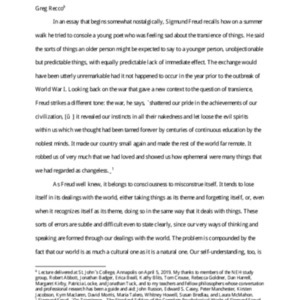 Audio recording of a lecture delivered by Louis Petrich on April 12, 2019 as part of the Formal Lecture Series. The beginning of the recording includes music. A PowerPoint presentation was given at the beginning of the lecture. Audio recording of a lecture delivered by Brendan Boyle on February 22, 2019 as part of the Formal Lecture Series. (Beginning of recording is cut off). Audio recording of a lecture delivered by Karol Berger on February 15, 2019 as part of the Formal Lecture Series. Audio recording of a lecture delivered by Daniel Burns on January 25, 2019 as part of the Formal Lecture Series. Audio recording of a lecture delivered by Matt Linck on January 18, 2019 as part of the Formal Lecture Series. Audio recording of a lecture delivered by Agness Callard on January 11, 2019 as part of the Formal Lecture Series. 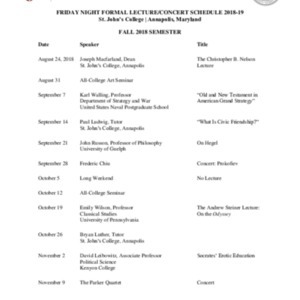 Schedule of lectures and concerts for the 2018-2019 Academic Year. 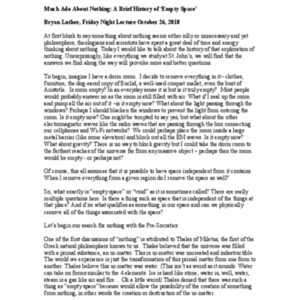 Typescript of a lecture delivered on October 26, 2018 by Bryan Luther as part of the Formal Lecture Series. Audio recording of a lecture delivered by Emily Wilson on October 19, 2018 as part of the Formal Lecture Series. Audio recording of a lecture delivered by John Russon on September 21, 2018 as part of the Formal Lecture Series. Audio recording of a lecture delivered by Paul Ludwig on September 14, 2018 as part of the Formal Lecture Series. Audio recording of a lecture delivered on September 7, 2018 by Karl Walling as part of the Formal Lecture Series. Audio recording of a lecture delivered on April 20, 2018 by Hannah Hintze as part of the Formal Lecture Series. Audio recording of a lecture delivered on April 6, 2018 by Daniel Harrell as part of the Formal Lecture Series. Audio recording of a lecture delivered on March 30, 2018 by Reviel Netz as part of the Formal Lecture Series.